Gorumara National Park is a National Park in northern West Bengal , India . Located in the Terai region of the Himalayan foothills, it is a medium-sized park with grasslands and forests.It is primarily known for its population of Indian Rhinoceros. Gorumara was a reserve forest since 1895 . The park was declared a Wildlife Sanctuary in 1949 , on account of its breeding population of Indian Rhinoceros . It was declared an Indian National Park on January 31 , 1994 . Originally as small as 7 km, Gorumara has grown by incorporating neighbouring lands to about 80 km. Political Geography:	The park is located in the Malbazar subdivision of Jalpaiguri district , in the state of West Bengal in India . Physical Geography: Gorumara is located in the Eastern Himalayas' submontane Terai belt. This region has rolling forests and riverine grasslands, and is known as the Dooars in West Bengal . The park is located on the flood plains of the Murti River and Raidak River . The major river of the park is the Jaldhaka river, of the Brahmaputra river system. 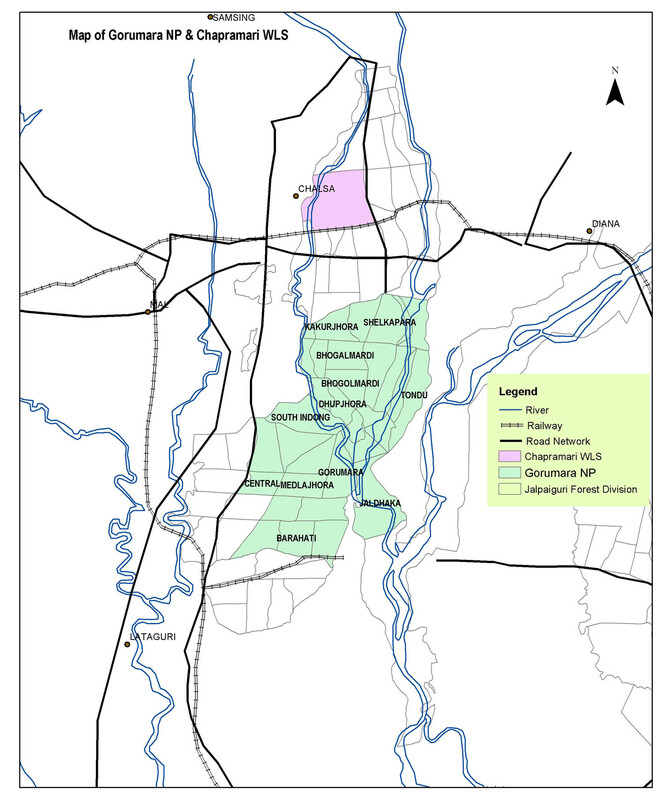 In this regard, Gorumara is a significant watershed area between the Ganges and Brahmaputra river systems. 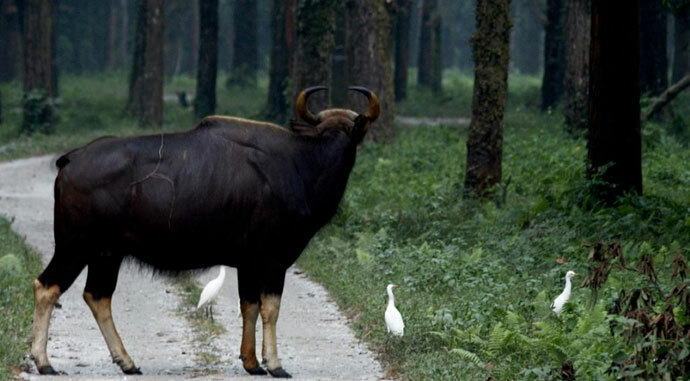 The park is very close to the Jaldapara Wildlife Reserve and Chapramari Wildlife Reserve .The park is 79.99 km in area. Climate: The temperature ranges from 10 to 21 degrees C from November to February, 24 to 27 degrees C from March to April and 27 to 37 degrees C from May to October. Rainfall mostly occurs between mid-May to mid-October and average annual rainfall is 382 cm. There is no history of human habitation in the park. The park forest bungalow dates back to the British Raj era, and contains a well-maintained log book from its inception, which makes for interesting reading. However Gorumara is encircled by many ethnic villages. More than 10,000 resident forest villagers derive their income from sources including employment in forest department activities, ecotourism, etc. Some of the villages are Sarswati, Budhuram, Bichabhanga, Chatua, Kailipur and Murti Forest Village. The park has recorded fifty species of mammals , 193 species of birds , 22 species of reptiles , 7 species of turtles , 27 species of fishes and other macro and micro fauna. Mammals: The Park is rich in large herbivores including Indian Rhinoceros , Gaur , Asian Elephant , Sloth bear , Chital , and Sambar Deer . Small herbivores include Barking deer , Hog deer and Wild boar . There is a comparative lack of large carnivores, with the only big cat being the Leopard . The park is not home to any resident population of Bengal Tigers , Indian Wild Dogs or Indian Wolf . Tigers are, however, occasionally spotted here. It does have numerous small carnivores including various civets, mongooses and small cats. The park has a large resident population of Wild boar , but the critically endangered Pygmy Hog has been reported from the park. It also has numerous rodents, including Giant Squirrels . The rare Hispid Hare has also been reported from the park. Birds:Gorumara National Park is famous for its bird population - which includes brilliant submontane forest birds like the Scarlet Minivet , Sunbird , Asian Paradise Flycatcher , Spangled Drongo and Great Indian Hornbill . Numerous woodpeckers and pheasants inhabit the park. Peafowls are very common. The park is on the flyway of numerous migratory birds , including the rare Brahminy Duck . Reptiles and amphibians: The park is home to a large number of snakes, venomous and non-venomous, including the Indian Python , one of the largest snakes in the world, and the King Cobra - the world's largest venomous snake . There are no ranger-led or otherwise four-wheel drive vehicle or elephant-back forays into the jungle. Hiking is permitted on metalled roads, but is slightly unsafe considering the population of elephants, gaur and rhinoceros present in the park. The park is closed in the Monsoon season from 16th June to 15th September. The best time to visit Gorumara is from November to March.One can also visit the adjoining forest villages to get acquainted with the lifestyle and culture of the villagers. A live show of the ethnic tribal dance can be seen every evening in Budhuram Forest Village.One can visit the Lataguri Nature Interpretation Centre for an interpretive exhibit of the local natural history. The park forest bungalow is an old wooden rustic cottage which has a watchtower overlooking the salt reservoir. Accommodations are also available in West Bengal Forest Development Corporation resorts in Murti by the side of Murti river and at Gorumara Elephant Camp at Dhupjhora . One can stay in newly constructed cottages in the Kalipur village at the fringe of Gorumara built by the State Forest Department. Accommodation is also available in the nearby town of Lataguri provided by private hotels. Nearest airport: Bagdogra, Jalpaiguri district, West Bengal about 80 km away Nearest railhead: Broad gauge: Chalsa , Jalpaiguri district, West Bengal is 18 km. from the park. Important railstations: New Jalpaiguri, New Alipurduar . Nearest highway:NH 31 between Siliguri and Guwahati passes over Lataguri, the entrance to the park. Nearest town:The town of Lataguri is 8 km from the park's entrance. Nearest City:The city of Jalpaiguri is 52 km to the South of the park.